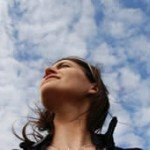 Comprehensive review of NeoStrata Natural Insta Tan. See what real experts and actual users have to say about this self tanning product. Price: $26.99 plus $20 for shipping to US! I really like NeoStrata Natural Insta Tan, so I gave it 3.75 out of 5 stars. There are only a few drawbacks and the first one is they don’t ship this to the USA anymore….what the heck?! When I ordered this it cost $20 to ship it here, but as I was writing this review I realized they don’t ship it to the USA any longer….sad day. Anyways, this one produces a really nice, dark tan….I love how it looks! It smells like almonds, although the next day I smelled a hint of DHA. It can get messy to use if you’re not careful. It has a really dark guide, so I’d definitely recommend using a mitt. I used a tanning mitt and I had no problems with application. Overall, I think this product is definitely better than average so I gave it 3.75 out of 5 stars. 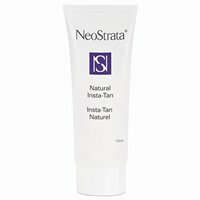 NeoStrata Natural Insta Tan is a dark brown lotion. The lotion is very slick and glides over your skin smoothly. The dark guide blends into your skin nicely. Application is a bit messy, but nothing I haven’t seen or dealt with before. The lotion is a really nice texture, but the guide is pretty dark so that’s what makes it a little messy. Just be extra careful when applying it, and you should be fine. I recommend using a tanning mitt to protect your hands, as this is a pretty strong self tanner. The dark guide blends easily into your skin, leaving you looking instantly bronzed. This lotion dried pretty quickly. 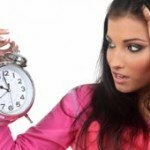 In 15-20 minutes my skin felt smooth and dry and I felt okay putting my clothing back on. I didn’t feel sticky while I waited for it to dry either, which is always nice. You do have to be careful, as this one has the potential to stain your clothing and sheets due to its dark color. This one smells so good when you first apply it. It has a light almond scent. I love almond scented products, so I obviously was in love with the smell! The next day, I smelled a little almond, but I also smelled a little bit of DHA. Both of these scents went away after I showered the product off. After using this lotion, I had a nice, dark smooth tan. I loved the color and how dark it looked. My tan looked amazing and not fake at all. With a lot of products with dark guides, after you shower most of your color washes off with the color guard. When I washed this one off, you visibly saw the guide wash off in the shower, but I was left with a gorgeous tan. I looked like I had just spent a week in the sun! NeoStrata Natural Insta Tan has 6.5% DHA in it, which they claim is the highest on the market. That’s actually not true, as I know I’ve tried tanners with more than 6.5% DHA, so I’m not sure where they’re getting that from. Regardless, this one gave me a nice, deep tan. I was really impressed by how long this one lasted. It lasted around 5 days before it faded away. It looked very natural, as it faded, and I wasn’t scaly or splotchy looking like I am with some self tanners. Yeah I think men who are looking for a deep color will like this one. It’s pretty easy to use and produces a nice tan. The tan lasts a while too! After shipping to the USA, this one was $11.60 an ounce, which is really expensive. In my opinion, it’s worth it, but that doesn’t help my wallet at all! To buy NeoStrata Natural Insta Tan, Click Here. Look and Feel This is a slick lotion, with a dark brown guide. Application It has a dark guide, so it can be messy if you’re not careful. Drying Time It took 15-20 minutes to dry. Smell (Before) Has a light, almond scent….so yummy! Smell (After) I could smell a little almond and a little DHA after the color developed. Color Produced I had a dark, smooth, natural tan. How Long It Lasts It faded after about 5 days. OK For Men? Yes, I think men will love this one. Price It’s $11.60 per ounce….WOW! Talk about expensive.